Share the post "In Memoriam: Professor and Extension Specialist George Wulster (1949-2016)"
George Wulster inspecting poinettias in greenhouse. George Wulster, professor and extension specialist in floriculture in the Department of Plant Biology and Pathology at Rutgers, died on June 14 at the age of 66. A resident of Lebanon, NJ, he retired after 36 years at Rutgers as a professor emeritus in January 2014. 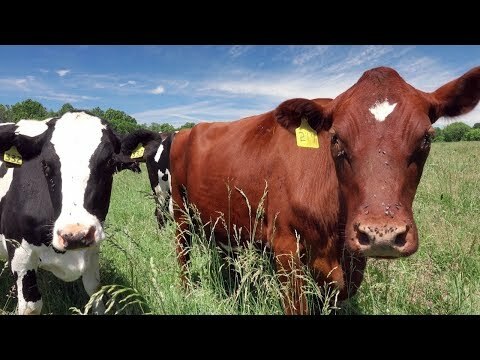 Wulster received his Ph.D. in post-harvest physiology from Rutgers in 1981 and worked closely with the New Jersey commercial floriculture industry as a consultant, in addition to his research and teaching. 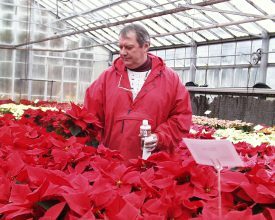 He also oversaw the production of more than 100 varieties of poinsettias in the Rutgers Floriculture Greenhouse on the Cook Campus. Wulster, who taught many graduate students over the years, deeply enjoyed mentoring young people and was considered a thoughtful, intelligent and remarkably decent person by his colleagues. Wulster began his career as a grower manager at Wright’s Roses in Cranbury, where he’d previously worked in high school. After retirement, he and his wife formed Custom Floral Postharvest Solutions LLC, with a special focus on tulip preservation. A memorial service will be held Saturday, June 25 at 11 a.m., at Church of the Holy Spirit, 3 Haytown Road, Lebanon, NJ, and will be officiated by Reverend Philip Carr-Jones. Family, friends and former colleagues are invited to a luncheon at the church immediately following the service. In lieu of flowers donations in Wulster’s name may be made through In Memory Of to benefit the following: Hobart & William Smith Colleges, The George Wulster Memorial Music Program, c/o Church of the Holy Spirit, 3 Haytown Road, Lebanon, NJ 08833, and the Melanoma Research Foundation.